I purchased three panels of the Chado Ralph Rucci Wool double knit from Mood Fabrics NYC because initially I had no idea what I would make with it. After deciding upon the dress, I still had yards left. So I thought a jacket and skirt combo would allow me to play with the purple stripe that’s a main feature of this fabric. My last post was about the dress so this one is all about the suit. I chose a jacket pattern that I’d used before – Vogue 8209 which is out of print – because the lines worked well with the fabric. All of the construction details for the jacket are in this post. This jacket is unlined without any closures. The fabric doesn’t really need a lining and that works well with my pattern choice. 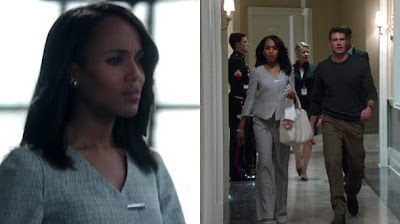 I was also looking for a piece that I could use one awesome pin as the closure ala this inspiration piece worn by Kerry Washington/Olivia Pope. Just like the dress, pattern placement was the key to using the fabric effectively. For the jacket I ran the purple stripes down the front and then used the leftover pieces of fabric to cut the sleeves. I thought it would add some interest to the jacket. I also went with my TNT straight skirt pattern for the second piece. This allowed me to come up with a suit that while it’s not another black suit, I thought would work in my very corporate work environment. However, after taking these photos, I realized that I would NEVAH EVAH wear these two pieces together, they really are “too artsy” for my workplace. But I did realize that I could separate the pieces and wear them with other garments from my wardrobe. Honestly, after allowing the jacket and skirt to sit, I will be removing the sleeves from the jacket. Even though I got the sleeves out of the remaining scraps of fabric, and it seemed like a good time at the time, now I know it’s not. I love the skirt and will wear it with a black twinset because this look works for me. But the jacket it needs to be revamped, so that it can become a viable member of my wardrobe. However, I highly recommend purchasing some of the wool doubleknit either online here or in Mood’s NY or LA stores.